What you get paid varies by place. 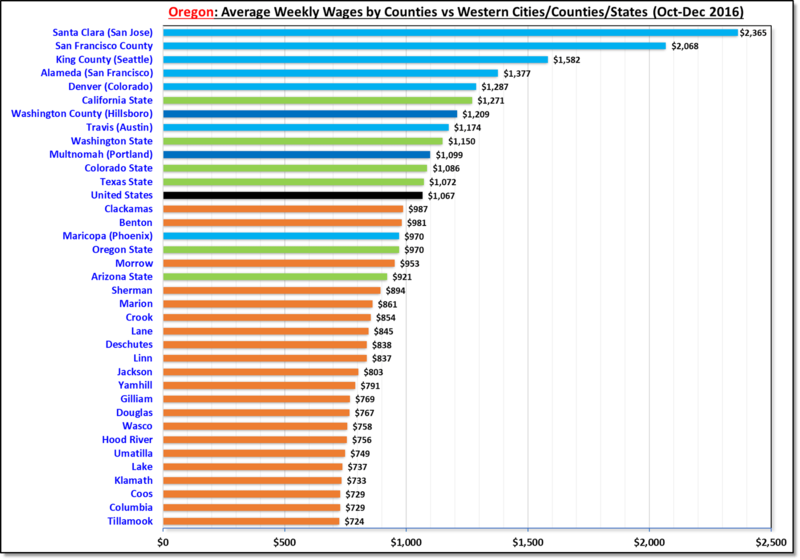 Weekly wages in Oregon counties vs select western states, counties & cities (Oct-Dec 2016). Weekly wages in Oregon are 25% lower than California and the highest paid county (Washington County) is almost half of the highest paid county of California (Santa Clara). Western United States has seen a strong influx of highly skilled labor. However, the variation in economic status is very large across different states as well as within the states. At one end, California has the highest wages followed by Washington, which has seen a strong growth (and is within ten percent of California). At the other end, Colorado & Texas have higher weekly wages than Oregon, followed by Arizona. Among counties, Santa Clara is one of the highest paying county, at 15% higher than San Francisco and almost 50% higher than the next Silicon Valley region of Alameda county. Seattle has grown into a strong technical hub with headquarters of Amazon, Microsoft & Boeing. The weekly wages in Seattle have started to compare with Silicon valley (higher than Alameda county in California but not as high as San Francisco county). The biggest surprise is Austin area which has wages comparable to Portland but rents and home prices are still more affordable than Portland. Overall, Phoenix has lower wages among these states but house prices are more affordable, and much diverse employers than other states.